Who is Wyatt as a son and as a friend? I believe I am a son who is loving, has the ability to grow as a learner and a human being, and for the most part, is able to comply with what he is told. As a friend, I may try to be too cool sometimes but I make sure to always be myself, as I only want to be friends with people who can accept me for who I really am. I will always back my friends and family, I am fiercely loyal! How was it moving from Chicago to LA? Leaving your home is a hard thing to do, especially moving to a new state. We had all of our friends and lots of family close enough to drive to. So initially moving to LA felt a little lonely. I love how Chicago is a city but has a small town feel, I still feel very comfortable and connected there. In LA it’s hard to make friends and everything is so spread out that getting anywhere takes a lot of effort, time, and patience. However, one of the best parts about moving from the Windy City to L.A. is not having to survive the winters! Over time I have met some amazing friends and I really do love the people I have in my life out here in LA. And of course living out here makes it much easier to be an actor! Do you remember your first audition? How was it? The first big audition I had was for an independent film called Little Boy. I remember going in there nervous, but coming out with great results. I was able to go into a room with adults I didn’t know and perform my scenes. It was an emotional scene and I felt very proud to have been able to show the casting director what I could do. I even got to go in for a callback with the director. Although I didn’t get the role, I felt like I had won because it reassured me that I was talented enough to follow my dream. Tell us about your most memorable audition story. I would have to say that my most memorable audition story was when I went in for Guardians of the Galaxy. I had to sit in the audition waiting room while in a sad mood, ready to burst out in tears. It is kind of funny when I look back on it because I was in the sad mindset and for some reason I was the last kid there and I had to wait a really long time to go in. It was hard to keep thinking sad thoughts and be on the verge of tears. I think the casting director had to take a phone call or something. Anyway, I went it in, gave it my all, and felt so good about it. The payoff is wonderful when doing something like that. To be able to make someone else have an emotional reaction to what I am doing and to sort of have a connection with them is amazing. When I walked out I told my mom that I felt I had just gotten myself a Marvel movie. By the time I got home they had pinned me for the project. Just to make sure, casting had me go in a second time and I gave them exactly what they wanted again. 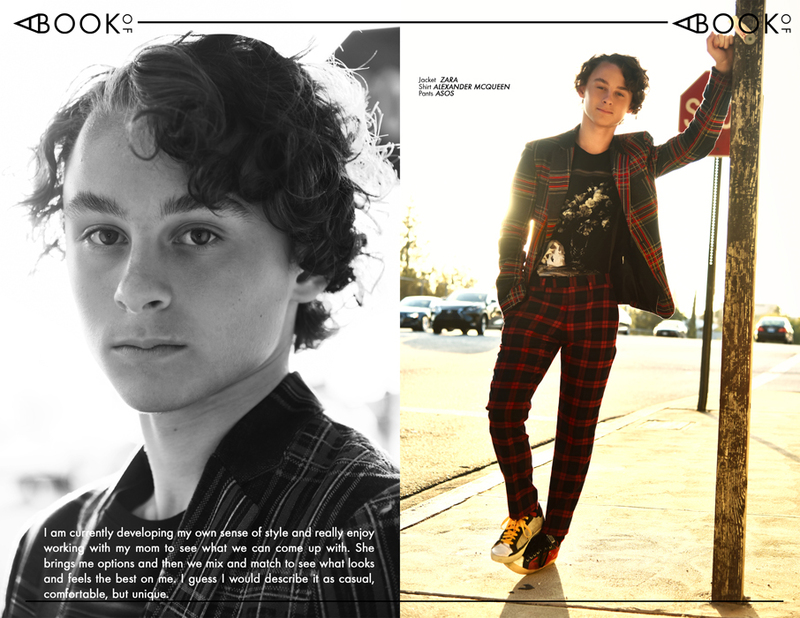 Walk us briefly to a day in the life of Wyatt Oleff. On a normal school day, I wake up after three to five alarms, depending on how tired I am. Then I shower, take a little break, pack my bag and lunch for school, and get on my way. School takes up seven hours (or more like 8 counting the time to get there and back), so when I get home, I usually sit down for around thirty minutes to an hour, to rest my mind and body. I then do homework, followed by whatever I'm feeling I want to do. On some occasions, I go out for auditions, prepare sides, or hang out with my friends. I would say people who really care for what they do, and work hard for their passion. Someone who only does something for money and they don't have fun while doing it just makes me feel sad for that person. What is it like to have an artist mom? Are other members of your family into the arts as well? My mom is an artist. Having a mom who understands what it’s like to follow your passion is a dream come true. She understands the ups and downs of being creative. I’m really lucky to be able to have someone to support me in so many different ways. Not only does my mom support me, but so does the rest of my family through lots of different ways. My Pappy (my mom’s dad) is also an artist. He and I used to draw a lot together when I was young, we had a sketch book together. Let’s talk about your recent movie “IT.” How was it to play Stanley Uris and do you relate in any way to his character? Stanley is a very complex character that I enjoyed playing because his moments are more subtle. He is uptight and instead of being extremely vocal about what he was going through I had to use my face and body to convey his characteristics. I had to set up Stanley as a character that just really can’t handle Pennywise (for future purposes). I am similar to Stanley in quite a few ways so I just had to exaggerate some of those traits. What do you think makes this remake of "IT" different from the previous one 27 years ago? First off, it isn’t really a remake as it is it's own adaptation of the book, so there's nothing from the miniseries that was taken to put into this feature film adaption. Also, the movie is only about the kids so that is very different from the TV miniseries. There is definitely a lot more gore and intense scenes in this new film, especially since it’s rated R. It was extremely important to the director, Andy Muschietti, to stay a true to the book as possible, so I feel that that really shines through in this film. The members of the Losers’ Club are some of the most memorable and relatable characters in pop culture. What is it in the Losers’ Club that makes them so relatable? The Losers’ Club is so relatable because you can find yourself in any one of the characters or maybe a combination of a few of them. These characters are very real and the movie presents them in such a way that you could feel yourself doing or saying the same things the Losers’ do. We are all different and the fact that that is what brings us together in the movie gives a sense of hope that we can all find the people we resonate with most. Let’s talk about fashion. How would you describe your style? Wow, well I am currently developing my own sense of style and really enjoy working with my mom to see what we can come up with. She brings me options and then we mix and match to see what looks and feels the best on me. I guess I would describe it as casual, comfortable, but unique. We know you love 80’s music. Which 80’s music are you vibing at the moment? I Always have Holding Out for a Hero ready, no matter the time. I also love Forever Young by Alphaville, True by Spandau Ballet, and Whip It by Devo. Top 3 music that most recently played in your head. What’s the best video game that you have ever played and why? I think I would definitely need a lot of time to determine what game is my all time favorite. I would have to say in terms of nostalgia, it would be LoZ: Majora's Mask. I know I'm nowhere near the age to experience full nostalgia but it definitely brings back good memories playing it. It was one of the first Zelda games I had played and it helped me really get into the series, and it has now become my favorite. From a game standpoint, I'd have to say LoZ: Breath of the Wild or Super Mario 64, just because each game has so many options to move around the vast map, that it just makes you want to explore every nook and cranny. They're both games to involve exploration (although Zelda awards that much better), and having fun characters to control is something that not a lot of games can make as fun as these. Although LoZ: Breath of the Wild is overall a better experience, just for the endless fun and possibilities it provides all throughout the game play, and I cannot wait for more from this game. Overall, from an objective standpoint, LoZ: Breath of the Wild would have to take the cake as my favorite game to play, but Majora's Mask will always be connect to my heart! Although I am very excited for Super Mario Odyssey as well, which will probably become my second favorite game of the year (behind Breath of the Wild of course). Of course this ended up being my longest answer, I could talk about this stuff for days. What would you say is the proudest moment of your career so far? Being a part of a movie that has been breaking records ever since the first trailer released has to be the proudest and most surreal moment so far. Just seeing all of those records was astounding to me and I'm glad we were able to tell this many people our story. What keeps you busy aside from acting? First and foremost school keeps me busy! Other than that I love to make skits with my friends (check out my YouTube Channel - Wyatt Oleff), I really enjoy play video games, the piano, going to the beach, and taking walks (no really). Any actor that you want to work with (dead or alive) and why. I would say that Heath Ledger seems like such an amazing person to work with. He had such a passion for acting and I want to be able to just sit down and talk about something like that with him, it would be a dream. Any advice you can give to young and aspiring actors out there? Patience is a must! You may be disappointed and get frustrated but you have to keep working and putting yourself out there, no matter how long it takes. It’s important to know that you may be great at the acting part but maybe the role isn’t quite right for you. If you want to try acting you should because it’s your passion, not because of fame. If you’re going to have your own book, what title would you give it? I would have to give it a title like “Internal Tao Te Ching Thoughts". It’s become one of my favorite books lately and I find myself reading excerpts very often throughout the day. If you had the chance to help a specific cause/charity, what would it be? At this time I am hopeful to begin working with Teen Cancer America. We have started some conversations on how I can be a part of the organization. Catch Wyatt in IT in theaters, September 8th, 2017.